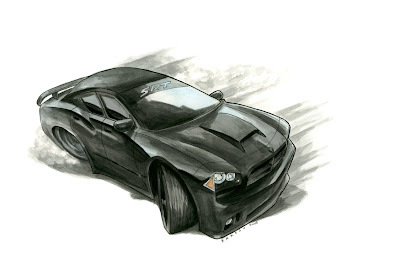 So a friend of mine bought this awesome car you see here and asked if I could draw a caricature of it for him. I don't know how I haven't drawn this car before. That SRT division does a pretty good job, I think. So I started working on this a while ago and ended up spending way too long on it. I probably spent more time on crappy sketches than I did on the final product. But I finally finished everything this weekend. Thats my official excuse for being late on the newest Code 11 installment. But I will have one up in a day or two, I promise. Anyway here's what the car looks like. 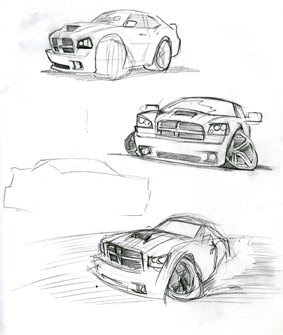 Here are some of the sketches I did, trying to work out in my head what the car should look like. I had an idea of what I wanted the final to look like. Here I have most of the details worked out for the final. Getting to this point from that other sketch took me a while. 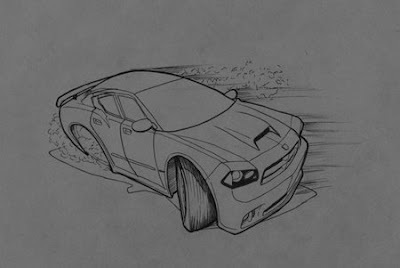 Getting it to look like a Charger instead of a generic box on wheels was tough. A lot of the time when drawing cars, I find a cool photo I like, and just draw from that . This one was an idea I had, so getting everything right was a bit more difficult. I googled lots of pictures and videos of drift races as reference. Here is the final product using ink and watercolor on arches. Ater I was done I was still thinking about one of the small sketches I had done in the beginning (you can see it above) and I wanted to see that one done too. Plus, even though the first one had the action I wanted, it wasn't showing off the rims. This one went a lot quicker for me because it was drawn more directly from a photo reference than the first one. 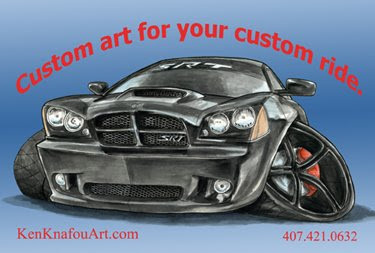 When my friend told me he was bringing his car to a car show this weekend and displaying my artwork with his car, I threw this together to have some postcards printed up. 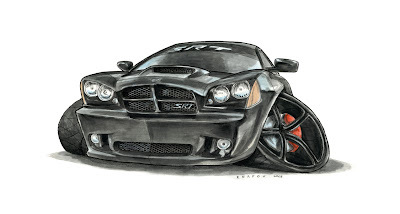 I would love to draw people's awesome cars all the time. Ken, it's so great to see your car art, as well as the process. I can wait a few days for (the GREAT) code 11, if this is the reason. 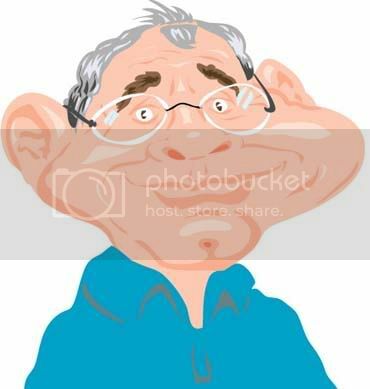 I also like that you worked in watercolor- it's a more solid medium, and suits you. I'd love to see more like this. Keep on doing these crazy drawings!!!!!!!! 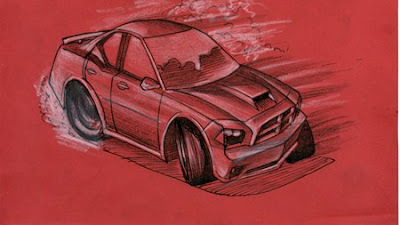 great car sketches, was totally into car caricatures for a while a year or so ago, these make me want to draw some more! Fantastic Ken! You Da Man!